This new band has that alt-country yet modern rock vibe along the lines of the Wallflowers and Train and, like those other bands, they write good songs too. 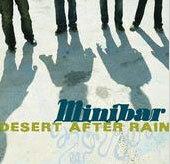 It's always difficult to gauge how a new band will do after their first release, but Minibar got off to a solid start. The opening track, "Holiday from Myself," is so catchy it'll be on repeat in your head all day long--definitely radio-ready material. The rest of the album kind of dips and dives from acoustic-oriented songs like "I Know Without Asking" and the title track, to rockers like "Visible from Space." On some songs lead singer Simon Petty sounds like another singer/songwriter reviewed on this site, Pete Yorn, while on others he brings to mind Elvis Costello. The final track, "So Long Soho," is haunting yet incredibly riveting. While this is a strong debut, there are some tracks that lack the hooks to keep your fingers off the "skip" button. But if you are a fan of good songwriting and the bands mentioned above, you'll want to check Road Movies out.